ORLANDO, FLORIDA - It's no secret that the airline industry is extremely competitive. That competition, however, isn't just limited to pricing, flight times, in-flight entertainment systems and in-cabin service. These days, it's also about an annual event called the Aerospace Maintenance Competition (AMC) - which happens every year at the MRO Americas conference (run by Aviation Week magazine) in Orlando, Florida. 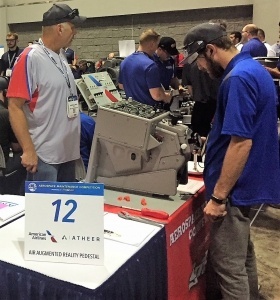 The Atheer-supported American Airlines team at the annual Aerospace Maintenance Competition in Orlando, Florida on April 9, 2018. In this year's competition, Atheer partnered with American Airlines, leveraging the capabilities of AiR Enterprise to create the "Atheer AiR & American Airlines Augmented Reality Pedestal". According to an interview in MRO Network with Ken MacTiernan, vice-president of the Aerospace Maintenance Council and chairman of the Aerospace Maintenance Competition, the teams consisted of five people per team, who performed 30 scheduled events during the three-day competition - ranging from basic safety wiring to composite repair to electrical and avionics troubleshooting. "The competition is a good stage and venue for new technology in aircraft maintenance. A perfect example of that would be an event that American Airlines is co-sponsoring with a company called Atheer, which writes software for augmented reality (AR) training," explained Mr. MacTiernan in the interview. "American is providing the center console from two MD80 aircraft, and the competitor is going to wear a pair of AR goggles. They’re going to be in communication with another teammate who is serving as tech service representative for a company who can see what they’re looking at, take a picture of it, and send them technical manuals. So that’s something else that the competition is bringing to the table— the opportunity to show industry, ‘Hey, this is what’s coming down the pike!’ It’s the aircraft technician who has to stay lock-step with that technology."